Blackbirds Lane runs from Kemprow, Aldenham to Aldenham 22 Crab Lane and Commonmeadow Lane, the one river ford on the Water Meadows, and thence to School Lane, Bricket Wood. Until recently, its status was not in doubt. 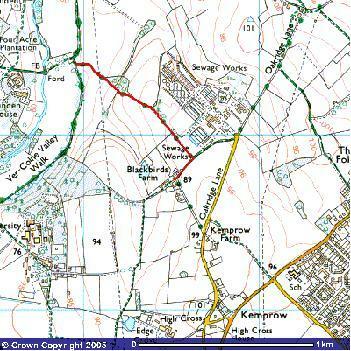 However, the county council's web site now records it as being public only from Kemprow to Blackbirds Farm. This doesn't explain, of course, where the Sewage Works bridleway (Aldenham 74) goes when it meets Blackbirds Lane, nor how it is that many riders have been using this path for as long as anyone can remember. Worse still, in April 2006, a new gate appeared at the southern end. This is a clear attempt to bring the public's right to use the path into question, and so we must vigorously defend the lane. Because there was doubt over its status, the BHS made an application to record the route. The County Council agreed with the evidence submitted and made an order recording the route as a restricted byway, that is, a route for walkers, riders, cyclists and cariage drivers. In February 2010 some people put out incorrect and misleading statements about the route. Read the British Horse Society's explanation of what is going on. Image based on original obtained from the Ordnance Survey Get-a-map service (2005). Image reproduced with kind permission of Ordnance Survey. The Hertfordshire Highways (Main Roads) No. 3 Order, 1898 designated this route as a main road. 28 Dec 05: Application made to have this path recorded. 19 Dec 07: Hertfordshire County Council announce their formal decision to make an order at Restricted Byway status. 26 Jun 08: The Hertfordshire County Council (Aldenham 82) Modification Order 2008 made to record route as a restricted byway. Objections received. 31 Jul 09: Official 'Start Date' for Planning Inspectorate case tracking purposes. 17 Mar 10: Start of Public Inquiry. Commences from the county road Blackbirds Lane at TQ 1453 9975 at the north-east corner of the farm buiding, joining Aldenham 10 and then running NE through Blackbirds Farm for approximately 150m to the junction with Aldenham 74 at TQ 1463 9986 where it turns to run NW along the track for approximately 690m to join Aldenham 22 at TL 1396 0040. Width: Varying from 4.5m to 12.5m as shown excluded from hereditaments on the Finance Act 1910 map, including the pond near Blackbirds Farm. Appears on definitive map sheet: 84. The order is for restricted byway (RB), not byway open to all traffic (BOAT). Since 2006 the law has enabled us to have old roads recorded with (RB) rights for horse drawn carriages, since that is how they would have been dedicated (so the legal theory goes) whereas before then only the byway open to all traffic status was available for them. It is correct that I applied for byway open to all traffic, but that was because the application was made after the change in the law was announced, but before it had been implemented, so it had to be done like that. Subsequently, as announced in Parliament, the Act backdated the provisions to the date when it had been announced in Parliament, so that applications made in the intervening period were considered under the new law, as this case was, resulting in restricted byway. Restricted byway records public rights for walkers, riders, horse drawn carriages and pedal cyclists. That apart, regardless of the status applied for, the route can only be recorded at the status that the evidence points to. Everyone who pitches up at inquiry and talks about irrelevant matters (i.e. those which the Inspector cannot by law take into account) will be wasting the Inspector’s time, and is very likely to be the subject of a costs order. (Sadly, despite the good intentions of the author of the email, I note that all the arguments suggested in the email are of the type that cannot be taken into account under the legislation.) When I give the BHS training on modification order work now, I have to go into careful detail on the costs regime, as it would be easy for the novice, unintentionally giving information that could not affect the outcome of the inquiry, to inadvertently get a bill for everyone else’s time – matters of desirability or suitability are irrelevant. Furthermore, it is only after a byway open to all traffic has been recorded that County will consider using the powers under the traffic regulation acts to make it an offence to use the route – just as happened on Tykeswater Lane, south of Radlett, which is a BOAT on which it is an offence to take a motor vehicle. The circulated email also talks about what might happen next. I can reassure everyone that by operation of the Natural Environment and Rural Communities Act 2006, any public rights for motorised users that may previously have existed on the routes left and right (and straight on) from where Blackbirds Lane meets Crab Lane at the lodge appear to have been extinguished by statute. It is possible that one of the exemptions applies, but I can see no evidence that this is the case at all. Had an exemption applied, it seems to me that it would have been uncovered by the County in their investigation into this present route, from the farmyard to the lodge. It is worth noting too that it is vitally important that all our old roads and routes are recorded as soon as possible. The Countryside and Rights of Way Act 2000 set a cut off date, after which bridleways that existed before 1949 but which are not on the County’s definitive map will cease to exist. Many of us are fearful that the cut off date will be brought forward for equestrian routes, just as it has already been brought forward (to 2006) for motorised routes. We could be next! We need riders to be collecting evidence to record their paths instead of fighting things that are actually in their interests. The local bridleways group calls for path use evidence periodically in their email and printed newsletters, so I’d encourage anyone who feels strongly about protecting riding routes to get in touch with them. Finally, on this route the real issue is where it starts at the southern end. The inquiry needs to focus on this, since if the legal record does not show it linking to another highway, it could be blocked off. The inquiry has been timetabled to cover this issue, based on objections that were made during the statutory objection period (which ended 2 years ago!) Diversions from the primary issue risk distracting the inspector from this and causing the inquiry to sit for additional days. I have been the BHS local access officer for Hertsmere for some 19 years now and have had over 50 paths added to the definitive map for equestrians. In this time I have never sought to disadvantage us and not one of my schemes has ever resulted in a route worse for riders! I think local riders would do well to join the local bridleways association, as their newsletter does explain things rather well and they’re only £5/year (www.pgbt.org.uk). Sadly, so many riders fail to join organisations that explain and educate on highway law – if we could turn that round with a membership drive at any concerned yard, I’d be impressed! I do give talks to groups that ask. We had over 40 at Writtle College where I was speaking last Tuesday, and they’ve asked me back in May, but I do need to be booked early for any particular date. They should join their local group to have a more effective voice.